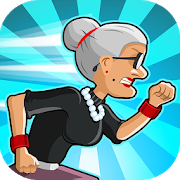 Take to the streets with ANGRY GRAN RUN! Our Granny has been locked away in the Angry Asylum by Fred the agent in white, she's plotting her escape, and she needs YOU to guide her through the streets once she's busted out! Run, jump, dash and slide over and around tons of different and WACKY obstacles in this crazy new endless running game!